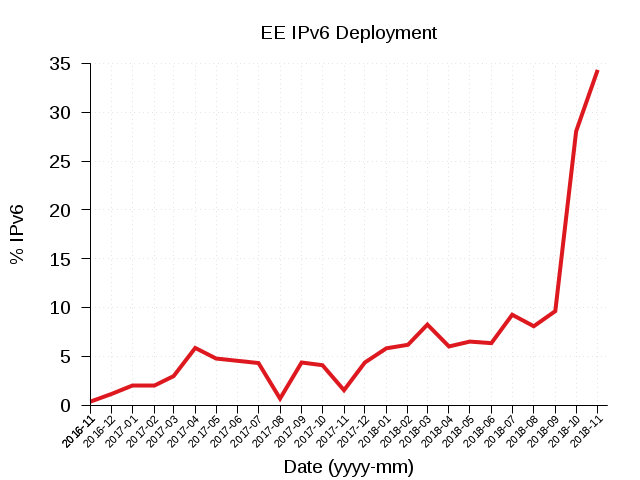 We just published this month’s IPv6 network operator measurements and they include evidence of some major new IPv6 deployments that I’d like to highlight here. Telmex (AS8151), is a Mexican telecommunications company headquartered in Mexico City that provides telecommunications products and services in Mexico, Argentina, Chile, Colombia, Brazil, Ecuador, Peru, Venezuela and other countries in Latin America. Telmex is the dominant fixed-line phone carrier in Mexico. 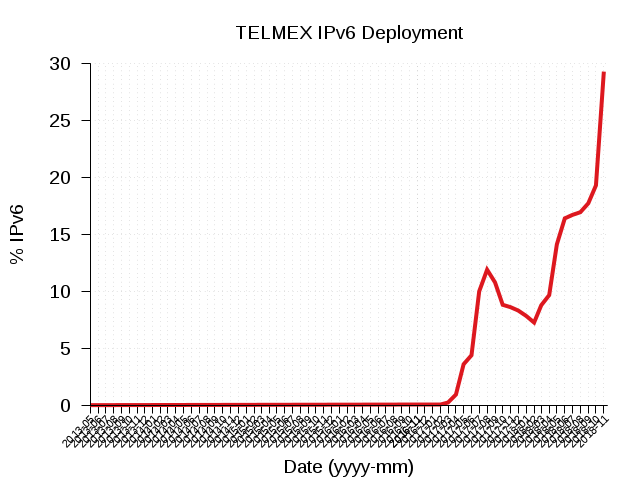 This month’s IPv6 network operator measurements show Telmex ranked 14th globally with a rapidly growing IPv6 deployment percentage of 29.28%. EE (AS12576), is a British mobile network operator, Internet service provider and a division of BT Group. It was established in 2010 as a 50:50 joint venture between Deutsche Telekom and France Télécom through the merger of their respective T-Mobile and Orange businesses in the UK. This month’s IPv6 network operator measurements show EE ranked 52nd globally with an IPv6 deployment percentage of 34.34%. 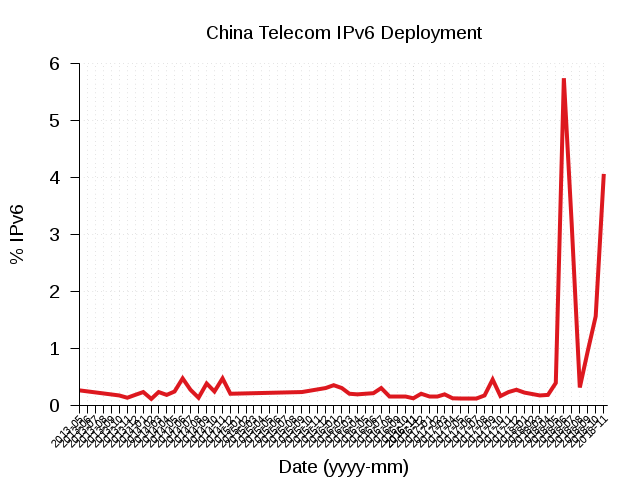 There also seems to be deployment taking place in China as evidenced by measurements of China Telecom and we may have more to say about that next month. Until then, you can view the full listing of newly updated IPv6 network operator measurements for this month. If you’re a network operator deploying IPv6 and would like to join Telmex, EE and the other networks that make up the ranks of World IPv6 Launch participants, please register your network for measurement.